Finally, add the cooked asparagus and peas and mix through gently. Then add half of the grated Parmigiano-Reggiano. Season to taste. Serve on warmed plates with the remaining grated Parmigiano-Reggiano and a simple salad of rocket leaves. 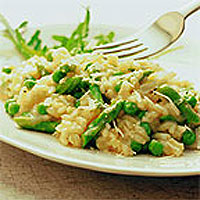 You can use other ingredients instead of asparagus and peas such as cooked chicken, smoked fish or seafood. Prepare and cook the ingredients separately and add them in step 6 after the rice is cooked. Take care not to overcook at this stage.